Susan told this story during a sermon Geoff preached about healing: if you would rather hear it than read it you can listen via our sermons page. Geoff addressed some of the difficult questions that arise in any discussion of healing, but affirmed that healing is a sign of Jesus’ authority. Our journey to parenthood was not a straightforward one! It took us 8 years to have our first child, including a vision confirmed many times, years of hormone treatment, an operation, an abundance of prayer ministry, seemingly endless waiting, and our first miscarriage (which was heartbreaking). 8 years was an incredibly long time! But at last he was born, and we delighted in him. After a year we decided to start treatment again to try for a brother or sister for him. Foolishly, we thought it might be a smoother path. Little did we know! Over the next 3 years, we had another three miscarriages, each of them devastating. I had a second operation which my consultant hoped would result in ovulation for up to 12 months. I was discharged from the hospital after 10 months as we had come to the end of the line. We had agreed that there was no more that could be done for us medically, and by this time, I had been having treatment for 11 years. There’s only so much that we could put ourselves through. But two months later, on the twelfth month after my operation, I became pregnant. We couldn’t really celebrate until after our 12 week scan because when you’ve lost so many babies, you learn to put feelings on hold somehow, just in case. But, our twelve week scan was all good, and we began to breathe again and look forwards. Because I had diabetes in my pregnancies, I had to be scanned fortnightly in the third trimester. On week 33, I had a scan and the sonographer went very quiet and excused herself from the room. We were shown to another room where a doctor scanned again and showed us, very clearly on the screen that the baby’s heart wasn’t right. She had a hypoplastic left heart – only the right side of the heart had grown properly. There was hardly anything on the left side. It was explained to us that whilst the baby was safe in the womb, using my circulation, once born she would need to be assessed. If the left side of the heart was too small to work on, she would die within days of being born. If the left side was big enough, she could have heart surgery to rewire her heart using her lungs, but would have a life expectancy of up to around 12 years and would have a limited quality of life. Amidst the many words, the diagrams drawn and the numbness setting in, the main thing I remember the doctor saying was that where hearts are concerned, they can close holes and widen arteries, but they can’t make ventricles grow. My mind was saying that that may be true, but surely God who knitted her together in my womb, surely God who invented hearts in the first place, surely God can cause ventricles to grow? He was our only hope. We knew he could, but we didn’t know for sure whether he would. So all we could do was pray… and ask others to pray… and ask them to ask others to pray! So that’s what we did. We wrote a letter to everyone we knew, and many of our friends sent it to everyone they knew, and the list of pray-ers grew longer and longer! We had emails from all over the country, and at least one email from every continent in the world, telling us that people were praying. One stood out to me, saying that she didn’t know how much we could believe for at this point, but assuring us that she and her friends were praying for complete healing. Ann Fasham, now here at Christ Church with us, had the letter via the school that she was teaching at, and she took it to her church who committed to pray. I had non-Christian friends who said to me that they don’t pray or even believe in prayer, but that for us they would give it a go. 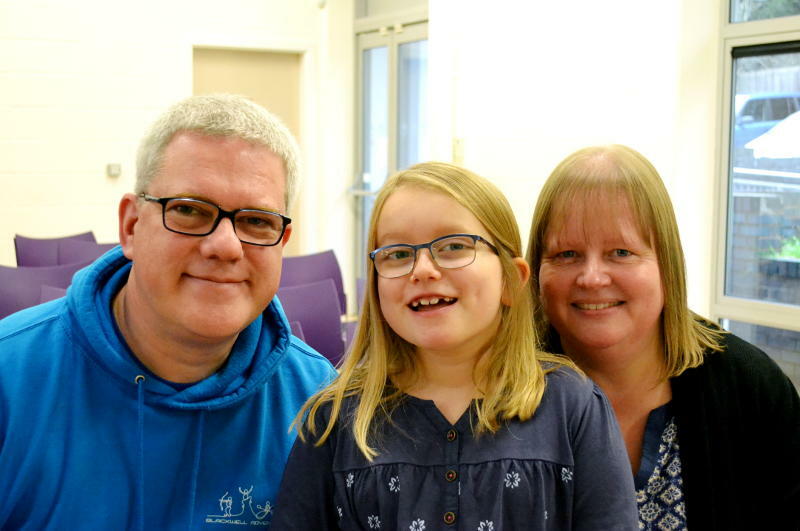 Our Christian GP was approached at a Bible conference in Somerset and asked whether she knew of this baby in Birmingham that they were praying for – and she was able to say yes, we were her patients! Our church prayed and wept with us. It was utterly incredible. And we just waited, hoping for the best, but preparing for the worst. We knew that in God we could face anything and we weren’t worried at all about bringing up a child with additional needs. We just wanted the chance to keep her. Our now 4-year old son was so looking forward to being a big brother and helping to push his sister in a pram that I remember saying that we needed to buy a pram whatever the outcome, so that if we only had her for a couple of days, he would have been able to push her around the hospital. Because of my diabetes, the birth plan was to have a Caesarean section two weeks early. This wasn’t ideal for the baby because a natural birth would have been better to clear her lungs for an easier assessment and, if possible, for the first operation. God and the baby overrode this Caesarean plan anyway and three days before the operation was due, I woke up in labour. 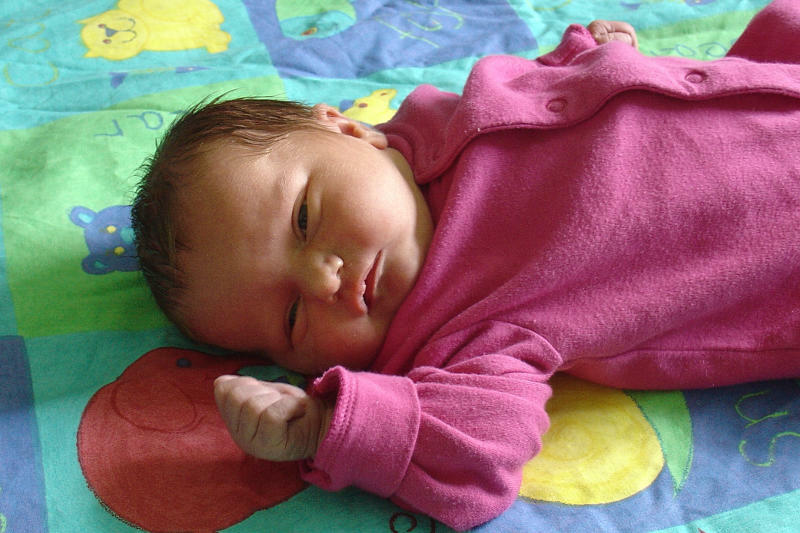 Within two hours, she was born at the Women’s Hospital. She was taken away from us, but not straight to the Children’s Hospital as planned, because it just so happened (or God had intervened to make sure), that because it was a Tuesday, the heart specialist from the Children’s Hospital was at the Women’s Hospital, so we could be with her for an assessment there and then. The consultant (the same one that shared with us the diagnosis five weeks earlier) took a long time over the scan, ‘umming’ and ‘erring’ before telling us that the left ventricle had grown! He said it wasn’t as big as the right side, and wouldn’t grow any more, but it was big enough to sustain life without any need for an operation! He looked pretty stunned about it! He then went on to say that there was a concern about the aorta which looked a bit blocked in some way (requiring a much more minor operation). The best way to assess this was to remove the drug which was at this point keeping a duct open in the heart, to allow the duct to close under observation and to see whether the heart continued to function normally or not. So she was transferred to the Children’s Hospital without us. At the Children’s Hospital, the medication was withdrawn and we waited… and all was well – the heart worked normally! No problem there then! Bit by bit, potential issues were eradicated. Her sats remained at 100% for the vast majority of the time and despite several tests, NOTHING could be found wrong!! It was absolutely amazing!! Of course, we were in different hospitals at this point, which was pretty horrible, but God even provided comfort there – unbeknown to me until just before her birth, one of the Chaplains at the Children’s Hospital was someone I’d worked with 20 years before at Youth For Christ. He visited her and prayed with her until we could be together, which was so reassuring. When we were finally all together, we had several visits from medical staff asking to see the Miracle Baby! My friend, the Chaplain, told me that word around the hospital amongst the staff was that ‘this just doesn’t happen’! It was a miracle for sure. We had planned to give our baby the middle name Ruth, but as she had been completely healed by God’s grace, we decided that Grace would be better. A couple of months later, we had a huge baptism where lots of the pray-ers came to join us, some of whom we’d never met before! It was a real celebration. Then, the following month, we returned for a final check at the hospital, remembering the words that we had been told – that her left ventricle was big enough to sustain life, but wouldn’t grow anymore. This consultant scanned her and said she had a perfect heart – the left side had continued to grow and was now the same size as the right side. God had continued to be at work and had brought about complete healing! And just a final comment to round up our story. Six months later, without any treatment, prayer or planning, I found I was pregnant again! Thankfully we hadn’t used the name Ruth after all and we could use it for our youngest. We had three children, all miracles and a sure sign of God at work. We are so thankful!